I covered some interesting discussion on this sentiment survey a few weeks ago. I fail to see how it can be viewed as predictive, rather than contrarian. Especially as this week we see it continuing to go up along with the market’s recovery. This week, Market Vane’s Bulls rose 6% points to 59%. That’s a quick recovery from 52% - the lowest reading since 2003. This sentiment reading continues it’s belligerence by having the bears fall 7% points to 35% and the bulls rise 2% to 40%. It never really showed any fear even in the recent market decline. Not even in mid August when other gauges were off the scale. Now, it has recovered along with the market. Basically it hasn’t been of much use. The bulls in this sentiment survey jumped to 50% and the bears decreased slightly to 41%. Although that may seem ominous, keep in mind that this survey is the most volatile of the lot and is just one variable among many. Although not strictly a sentiment indicator, the NYSE public short ratio keeps track of the activity between the specialists and the public as they engage in selling securities short. As the specialist counter-balances transactions made by the public, we get an idea into the mood of the public. Right now things are very skewed. The public has been extremely active in selling stocks short and the specialists extremely active in taking the other side. I’ll leave you to decide which camp you’d prefer to side with. I featured some magazine covers as examples of great contrarian sentiment signals last week. Although the cover to the left doesn’t involve the general stock market, it is nevertheless, a great omen for the uranium market. Thanks to Mr. Obvious (a reader) for the reminder by the way. 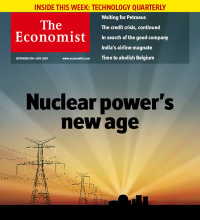 I had noticed the Economist cover and read the issue but somehow forgot to include it in my “uranium bull market” post. If you’re long uranium or uranium related stocks, you really have to think twice with this sort of cover coming out. Of course, there are also other factors but sentiment seems to be running a tad too high.